Men’s hats during the 1920s ranged from season to season. Warm summers, such as in the time of the Great Gatsby, brought out straw Boaters, Panamas and Longhorns as well as linen flat caps. The cooler seasons kept men in conservative suits with Bowlers, Derbies and Fedoras being the best hat choices. Unlike today, men and women always wore hats. Every day, every occasion, called for a hat to match your outfit. Light colors in summer. Dark colors in winter. Let’s take a look at the different styles of 1920s summer hats first. 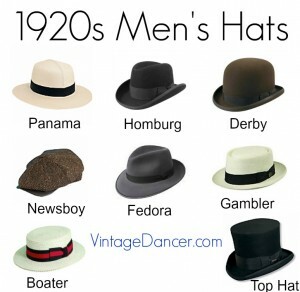 Skip the article and buy 1920s men’s hats here. 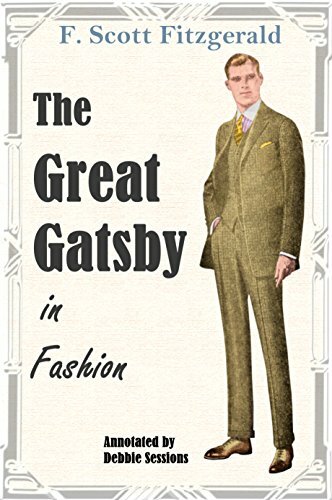 The hat that the Great Gatsby wears most is the flat cap. MOre recently Peaky Blinders men are wear tweed caps reflecting their urban status. Also known as Ivy caps, cab driver hats, newsboy caps, golf caps, driving caps, and big apple caps. It is made of 8 triangle panels that meet at the top with a covered button made in the same material. It has a small brim that the top rests on. Overall, 1920s caps looks baggy, not tight narrow Ivy caps you see today. In the summer, these caps were made of a light colored linen or cotton poplin material and lined in silk for breath-ability. In cooler weather, the caps came in tweed, herringbone wool, and corduroy as well. Darker colors were worn in the winter– blues, greys and browns– in solid, plaid and check patterns. All classes of men wore these hats, even boys selling newspapers on street corners, hence the newsboy hat name. It was mostly a working man’s hat from working class origins as a fisherman’s hat. It became a well-to-do men’s hat when worn with sporting clothes or upper class leisure clothing such as golf. For auto drivers, it was ideal since there was no stiff crown to bump into the car roof. It remained a sport hat for golf well beyond the 1920s. Straw hats were even more popular than flat caps for hot summer days. Outdoor sporting became the new hobby for men and women. From tennis to biking to riding in your new car– the people of the 1920s were outdoor enthusiasts. Boating became popular, and with it the boater or skimmer straw hat was worn. Boaters were handwoven thick straw made into a heavy solid cylindrical hat with either a 2 inch or 3 inch brim. Skimmers had the smaller brims while boaters had the larger. Other than that, their shape was the same. They each had a solid or striped Petersham ribbon around the base. College kids and alumni often wore their college’s colors on their hat bands. Many men’s “gentleman’s clubs” also produced bands with their club’s colors. Barbershop quartets are often associated with these hats. Popular in the 1910s and 1920s for summer time entertainment, they became the staple uniform hat for singing musicians. Another common straw hat for summer was the Panama, in particular, the Optimo Panama hat. It was hand-woven of very lightweight reed straw from South America, where it was woven and imported from Ecuador. It could be rolled up and tucked into a lapel pocket, which made it very easy to travel with. The rounded cronw and rolled crease down the center of the hat defines the Optimo style. Both men and women enjoyed this style of hat. The other Panama option was the South American Panama hat with a flat telescope crown that more closely resembled a lightweight boater or skimmer. Authentic Panama hats were quite expensive, so only the elite could afford one. Other styles of straw hats existed in the 1920s. While the shape doesn’t have a name, they generally resembled their felt hat cousins, such as the fedora. From “Straw Hat Day” in May or June or “Felt Hat Day” on September 15th, only straw hats were to be worn, regardless of weather. It was a tradition that caused annual riots of hat smashing. TIP: Don’t go budget on a Panama hat. The non-packable varieties need careful care to make sure the straw does not get bent. Once damaged, it’s not reversible. Trust me, I’ve learned the hard way. A few decades before the 20th century, a man developed an oval shaped hard material hat for riding. The edges were curled all around and finished with matching petersham ribbon. It was designed to protect a man’s head while riding through bushes and ducking under branches. It remained a popular hat with men even without horses. Although materials softened a bit from the 1900s hard hats, the Bowler, also known as a Derby, was the most common men’s hat of the early 1920s. It was an appropriate alternative to the formal silk top hat. Black was the most popular choice, although stylish men also had brown, tan or grey bowlers to match their suits. Towards the end of the 1920s when men and women’s fashions became bolder with color bowler hats appeared in blues, greens and other more festive choices. In the summer months, a bowler could be made of straw although these were less common. Usually, they were made of light weight, light colored felted wool. A cousin of the bowler is the Homburg. Worn in the decade preceding the ’20s, the Homburg looked like a bowler with a long crease down the middle. They were also considered somewhat of a formal gentlemen’s hat. Black, brown and grey were again the primary colors. Ribbon bands were quite wide, as they generally were on Fedoras and other soft felt hats, too. The crown was tall and straight on the sides. The Homburg quickly went out of fashion in favor of the soft creased Fedora by the mid 1920s. In the 1920s, the fedora hat was just entering the fashionable scene for men. Previously, it was a women’s style hat starting in the 1880s. 1920s men’s fedoras featured wide 3 inch brims that were shaped downward on both the front and back side thus making the sides rolled slightly upwards. This shape was popular with young men who called it the snap brim or swagger hat style. Otherwise, brims were turned up on one side and down on the other, a style preferred by more traditional men. Fedoras also had a sharp crease down the middle that could be a single crease or a triangle shape with the base of the triangle at the back of that hat. Hats came uncreased when purchased so that the owner could decide how to shape it. Popular colors were olive green, black, brown, and gray. Hat colors often matched suits, but it wasn’t a universal rule. While the felt fedora started out as a middle class hat, wealthy men associated with prohibition and crime, aka Al Capone and his gangsters, were icons for the hats in the 1920s. A solid color band with a flat bow wrapped the base of the hat. Usually the band was made of petersham or silk and matched the color of the hat. For extra style, the band would be in a contrasting color, like white on black. A feather on the side of the hat did appear on some hats but wasn’t very popular till the 1940s. The Trilby is another name for essentially the same hat as a fedora. Trilbys featured tall crowns with a crease down the center, rolled up side brims and a wide Petersham band with flat bow on one side. Common colors were black or brown with a matching band. In the 1920s, hats were almost always made of beaver fur felt. Other fur felt hats came in a variety of tall crowns with and without creases, indents and wide brims. Some were crushable, and some were hard to protect heads while in labor jobs. They lacked specific names. We can see some other types of men’s hats in the catalogs below. The Columbia hat was similar to a Homburg sometimes without the center dent. The Congress style was an extra wide brim Homburg hat. The Carlsbad was a very tall and wide felt with one or two dents up the front. There were also workmen’s hat and cap and sport caps made of fur or corduroy. The mid height beaver fur or silk top hat with curled brim was still the best hat for formal wear in the 1920s. It had been popular for a century and remained the hat for formal wear for another 50 years or more. It was an everyday hat until the 1920s encouraged informality and soft hats in all matters of dress. Many traditional upper class gentlemen still wore them in business settings and especially democratic political gatherings. The younger generation thought they were a “vicious, vile, and ugly symbol of the ungodly Victorian” said Westminster Abby’s Canon Donaldson in 1927. For most men, dawning a silk hat was something only done at weddings and grand opera performances, where men in cheaper seats found it more useful to have a collapsible silk top hat that they could tuck under their seats. If you are lucky enough to find a 1920s hat in good condition, then you are in for a real treat. Most felt and straw hats were well worn by the end of a season, if not completely destroyed by the elements and frequent handling. Otherwise there are quite a few choices in new men’s hats that still embody the 1920s style. Looking for hat patterns – Phryne Fisher vintage. – just love the murder mysteries! It is an 8 panel cap. I love this – such an interesting read. It must’ve taken quite some time to curate all of this information. Wonderful. Thanks! Could you help me out with what you call the kind of shirt collar the man in the picture on this page labeled “1924 Man in Bowler Hat” has on? Just bought my first “newsboy” today. Isn’t that hat also called a Topper? A “topper” is a formal top hat but it is possible “topper” is used for any kind of men’s hat in some English languages. Congrats on your first newsboy hat. They sure are fun to wear. The best brand is Stetson. They are very well made. That 1927 man holding a Panama hat is Irving Fischer, influential economist. Ah yes, thank you. I will add the caption now. Thank you so much! had wondered about the initial “status” of Optimos, in contrast to the seemingly ubiquitous boaters, during the 1920’s. I will say one other thing, and that is, thankfully, I am not as elderly as the gentleman in the photo–for a while yet, anyway. Ahh, thanks for that picture from 1927 of the gentleman with the Optimo Panama Hat. As much as I love boaters they don’t quite look right on my face, and Optimos are–well, optimal, for me. Optimo hats were usually a wealthy mans hat while the boater could be a cheap/throw away type. Wearing an Optimo would certainly make you a more sophisticated gentlemen. Good choice! Here is a blue plaid one: and a blue linen one: and dark blue cashmere: That’s all I can find in the 8 panel newsboy style. There are some others in blue that are a Ivy hat style which is more 1930s.